By all accounts, Jo Cox was a wonderful, gifted human being: a beautiful wife, a loving mother, a dedicated humanitarian and a talented politician. She was clearly destined for higher and greater things: what they were, we shall now never know. Her assassination (we’re not hearing that word very much, for some reason) just a few days before her 42nd birthday has shocked the whole country and distressed the democratic world. Politicians have paid their tributes, journalists have written their eulogies, and little bunches of flowers wrapped in cellophane are being placed around the war memorial in the centre of Birstall in her constituency. People who never knew her suddenly feel they did, and the heartbreak of a husband and two children has become the pain of us all. Parliament is sickened, a political family is bereaved, and a nation is in mourning. Perhaps we ought to leave it there. 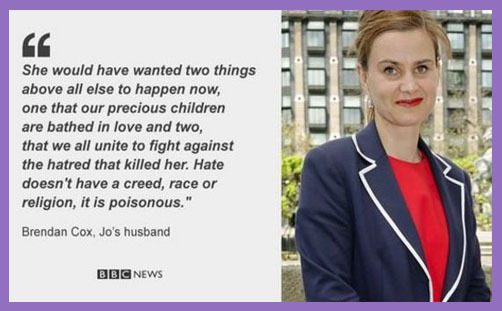 Just sit in cyber-candlelight and silent vigil and do as Jo Cox would have wanted us to do and what her husband has asked: bathe her precious children in love, and unite to fight against the hatred that killed her. ‘MP dead after attack by Brexit gunman’, writes the odious Daily Star. Don’t worry: nobody with a brain cell reads that rag. Yet then we get: “Nigel Farage isn’t responsible for Jo Cox’s murder. And nor is the Leave campaign. But…”, writes Alex Massie in the valued Spectator, with the most damning ‘but’ in the history of the magazine. And then a brief thesis from EU Commissioner Dimitris Avramopoulos: “Jo Cox murdered for her dedication to European democracy and humanity. Extremism divides and nourishes hatred..” And with this, you begin to see how the laudable fight against hatred becomes a fight against what some people hate, and evil becomes all that is disagreeable or contentious. Brexit? Good Lord, no, not now. It is driven by the demons of prejudice, hatred and bigotry. Jo Cox was for Remain, and we must honour her memory by voting to remain. It is what she would have wanted. Perhaps we ought to leave it there.